I love stories – reading them, writing them, telling them. For me, there’s something very satisfying about wrapping words around ideas, but there’s something almost MAGICAL about telling the wordless story through photos. These are the things that inspire me to shoot game photos and write this blog for the Indians. I’m especially captivated by candid, in-the-moment photos (like these). There’s an extraordinary authenticity, depth and imperfectness in these images whose stories could never be adequately expressed with even more than a thousand words. Having a good camera, the right lighting, the perfect angle are all important to storytelling done through the camera lens, but far less so than anticipating and spontaneously recording the moments of reflection, celebration, even sadness and frustration from which a wordless narrative springs. It’s gratifying to hear that the photos I take of the Indians give delight to others. I consider it a privilege to tell the stories of these special moments through the lens of my camera. Let me first apologize for such an uncharacteristically lengthy post. My initial intent was simply to write a little something about the importance of team uniforms. But I discovered some interesting and perhaps little known facts about the history of MLB uniforms, so I’ve included them here for your enjoyment. The Indians have two jerseys – gold and black – and wear their pants both long and short, but all players wear the same “uniform” (style and color) in the same game. Around 1900 all MLB teams were wearing team uniforms following a failed experiment where each player wore a different colored outfit based on his position, this in an attempt to help scorekeepers attribute errors to the correct players. Can you imagine how confusing that must have been? Colored socks were part of the uniforms in the early days of baseball. Stirrups, which began to decline in 1990s when a few key players started wearing their pants down to their shoes, came into existence in the early 1900s after a player got blood poisoning from being cleated through his dyed sock. Dyes back then were not colorfast and it was believed that the dye seeped into the wound causing infection. So a white “sanitary” sock worn with a stirrup – a separate colored covering that had a cut out around the ankle (so that players could still fit into their cleats), was introduced. The opening of the cut out was intentionally small so that the sock still appeared to sport the team’s colors, stripes or logo. In the 1920s, numbers were placed on the backs of jerseys. And as more games were televised, players’ names also appeared on jerseys, and home and away uniforms were issued. They help visually distinguish competing teams and identify players. They foster team spirit, pride and unity. They create a sense of player equality. Last time I checked, pants were part of the uniform, and “style” meant a manner of doing something, a distinctive appearance. So to me, wearing pants in a different manner violates both the letter of the law and the spirit of it. Rules aside, many fans say that they don’t like the long pants – it looks sloppy. Others argue that pants worn at the knees help umpires see the strike zone more consistently, but there’s no hard evidence to support that. Interestingly though, umpires once fought against the long pants because THEY felt it made it harder to see the strike zone (which ends at the knees). And it’s also said that Leo Durocher told Willie Mays during a hitting slump to pull his pants up to his knees because he thought it was costing him strikes. Mays got two hits the day after he did as his manager asked - so you be the judge. I personally don’t have a strong opinion about long pants vs. short pants. I do have one about the uniformness of uniforms. Our coaches must too. They apparently appreciate the value of a team “uniform” and adhere to the dictionary meaning of the word as well as the official rules of the game. But they also appreciate that players may have varying preferences about how they like to wear their pants. To accommodate this “variable,” for some games our players collectively decide to wear long pants; for some games they decide to wear short pants – but they ALWAYS ALL wear their pants the same way in the same game. This does not vary. They look like a team. They play like a team. Maybe we’re on to something! On April 6, Bob and I celebrated 44 years of marriage. We were just kids -19 and 20 years old; two high school sweethearts who met at a burger joint where we both worked. There was a snow squall the morning of our wedding day. Huge snowflakes that seemed to be the size of baseballs fell from the sky then quickly disappeared as they hit the ground. Some say that snow on a wedding day is considered good luck. Maybe. In retrospect, those baseball-sized snowflakes were probably more of a foreshadowing of what our life together would become. I should have known. Before we got married, I knew Bob enjoyed baseball. He played in high school and on the Legion team. We talked about baseball sometimes – how as a little boy he wore clunky corrective shoes instead of sneakers to play ball because he had been born with a club foot; how he played 12U ball as a 7-year old; how he played ball every day, all summer long as a kid, stopping only for lunch and dinner. I should have known how deeply the baseball waters flowed within him. On April 8, two days after we were married, we drove to Williamsburg VA to spend a few days. 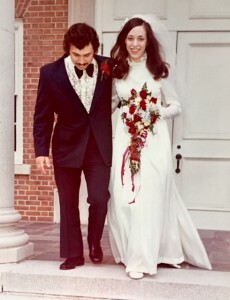 Our honeymoon was modest – even by 1974 standards. We checked into a nice but unpretentious motel with a lake view. We toured the Colonial city. We ate fast food. Whatever the day lacked in frills was more than made up for in the fun we were having simply spending our very first vacation day as a married couple. If I had missed the telltale signs beforehand of the life I was destined to live as Bob’s wife, the first evening of our honeymoon should have been my wakeup call. Back in our motel room, in the romantic, blue glow of a TV screen, we watched Hank Aaron hit his 715th career home run, shattering Babe Ruth’s longstanding record. It was a memorable night! Looking back, I can now see how much baseball has always been a big part of Bob’s life. I can’t say that I ever cared much about baseball all those years ago. But slowly and without notice it seeped into the available spaces of our life together until it became what it is today - a part of “us.” Two had become one. I should have known. Team uniforms were distributed to the new crop of Indian players this week – another step in the natural progression from January’s player evaluations to April’s first game of the season. I’ve recently learned though that this is not necessarily an insignificant part of an ordinary process. 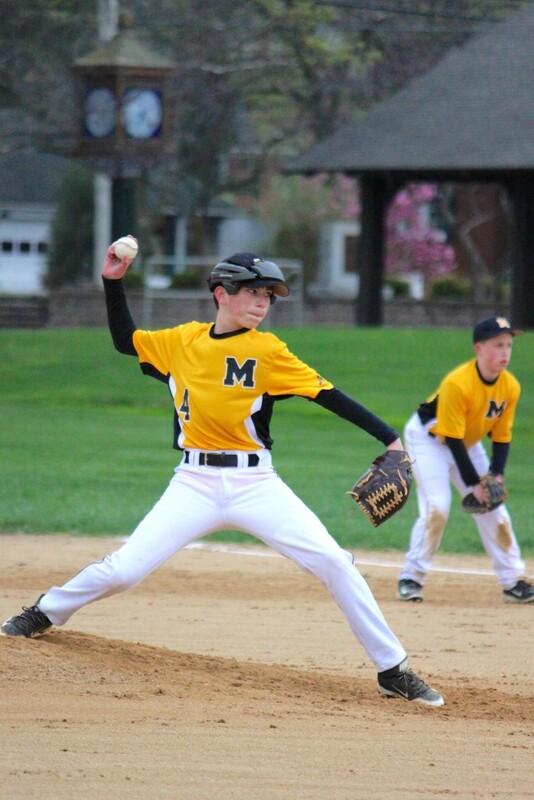 Arriving home with his black and gold Indians jersey in-hand, one newly minted player proclaimed, “Dad, I’m now officially a Mountville Indian. I can’t even describe how much this means to me.” Wow! 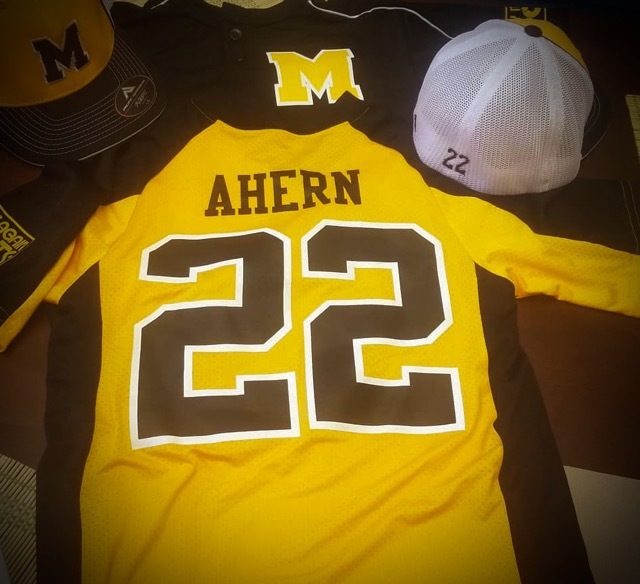 More than “making the team,” the seemingly simple act of bestowing a team jersey to him was validation that his dream actually had now, finally, become a reality – a larger-than-life reality of which he was in total awe. The weightiness of an Indians jersey placed in the eager hands of a wide-eyed, first time Indian player can belie the shirt’s physical size. Woven into the fabric, sewn into the seams can be the heft of some pretty big dreams of a kid who has always imagined what it would be like to wear an Indians uniform. That makes it a pretty big deal. But where the dream ends, the hard work begins – the work of translating the dream into the experience. In baseball as in all of life, to preserve a dream’s worth, we need to give our very best in living it out, not just now-and-then, but every day – at every game, practice, at-bat, and during every play and inning in the field. We must be willing to “give the shirt off our back” – do whatever is asked, no matter the sacrifice; only then will we be able to look back on a dream and see that it actually became all we imagined it could be – and possibly more. Hard to believe it’s been almost two years since I last wrote a blog post. No excuses – other than I felt I had run out of things to say. And before I knew it, days had turned into months and months into years. There’s one thing that has been on my mind lately though. As I meet the parents of new Indians players each year, it seems that they keep getting younger and younger. Not so long ago, players’ parents were close to Bob’s and my ages, and their kids (the Indians players) were about the ages of our kids. But over time, the parents of the players have gradually become closer to our now grown children’s ages, and the Indians players are now the ages of our grandkids! All this seems to have happened overnight. And while I’ve become increasingly aware that the parents seem to be getting younger, I’ve conveniently ignored the real reason this appears to be so – Bob and I have gotten older! I easily can rationalize my unawareness of this thing that should be so painfully obvious. Because the age of an Indians player as well as his parents’ ages have remained relatively constant over the years, I never gave it a second thought that Bob and I had not stayed the same ages too! (Great concept. Faulty logic!) As days turned into months, months into years, in my mind we simply had remained blissfully frozen in a time warp, never having blown out even a single birthday candle! Truth is, since Bob began coaching the Indians, we HAVE blown out lots of birthday candles – thirty-one years worth to be exact. In fact, “Happy Birthday” has been sung to us so many times that Bob now has coached against young men HE once coached; former players have kids playing baseball; and parents of former players cheer for grandkids up to bat. For many of us, twenty-first century life can be summed up as: WAY. TOO. BUSY. Family, work, school, lessons, games, groceries, laundry, the gym, meetings, practices —oh, and hopefully a little time set aside for eating and sleeping. Constantly being bombarded with so many first-world demands can feel suffocating. Sometimes we barely can catch a breath! Add to this technologies, gadgets and gizmos that enable and entice us to be ever-available, ever-multitasking, and it’s easy to see why we are ever-exhausted. I don’t know about you, but every now and then, in the midst of the mania, I need to take a nano-second to just “be.” To sniff the air after a thunderstorm; listen to birds chirping at dawn; gaze at the constellations at night – watch a sun set. I know first-hand that this isn’t something everyone is automatically wired to do. It certainly isn’t in my Indians-coach husband’s DNA. He usually can’t slow down long enough to soak in the little things I find so refreshing and inspiring. But a few weeks ago, during a particularly intense game, the most wonderfully unexpected thing happen. Time-out was called. The Indian players hurried to gather around their coach for instruction, and then – they all looked skyward where brilliant red, pink and purple streaks had been painted across the evening sky. 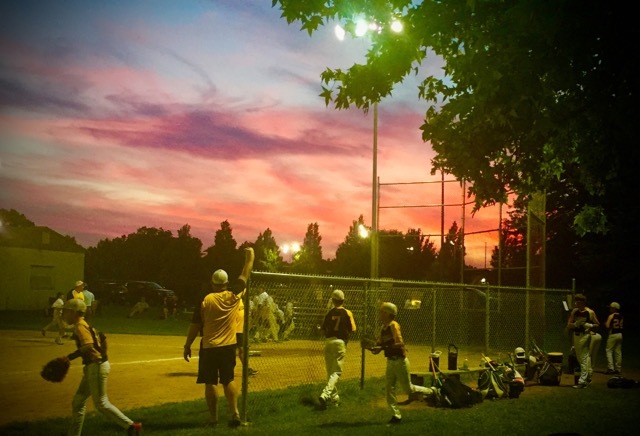 “Take a look at that sunset,” someone heard my husband say to his team. And then just like that, it was over. The game resumed. Our team eventually won, and the “breath-taking” time-out was forever inked in the score book. Last evening was a pretty rough outing for the Indians. Losses never feel good. A 20-2 loss feels lousy. It may even feel like the worst thing that could ever happen. Rational people understand that losses in athletic competition are inevitable. The key thing often overlooked though is not giving disproportionate focus to or exhausting braincells on evaluating losses. They’re merely moments – single points in time from which we can learn something of value, then must quickly move on, better in some way for having had the experience. The most important take-away from any loss is finding a way to move on! So “keep going” Indians! Refuse to dwell on last night’s (or any) loss. Deny permission for a loss to become a defeat. Win or lose, that’s the attitude that will define you as winners of the highest caliber, whether on or off the field! How Many Baseball Players Can Fit in the Back Seat of a Pick-up Truck? The rear seat of Bob’s truck is equipped with only three seat belts, but somehow the four 11 to 12-year old boys squished together, the two on either end angling their bodies sideways, just enough for all of them to fit in snuggly. You gotta really like your teammates to get that close to them – especially in soggy uniforms. And it was evident that they did. I’m not certain exactly how we ended up as hosts to these specific players – or any players for that matter – except to say that the early evening cloud burst had kicked-up so fast and furious that it was each person for him or herself when it came to grabbing the closest available umbrella or hopping into the nearest vehicle. They told us their funny little stories, and we told them a few of our own. You know, the kind of stuff you hear and say around the family dinner table. We laughed. And then, almost as quickly as it had begun, it was over – the rain, the banter, the questions, the laughing. The kids piled out in search of their families, who also had sought refuge in various places of convenience during the storm. And there we sat, just Bob and me, alone now with the musty smell of damp truck seats, sweaty bodies, and wet baseball uniforms. It was the most fun I remember ever having during a rain delay (which eventually turned into a postponement). Here’s the million dollar question: “Why don’t pitchers – especially at youth levels of play – have to wear protective headgear, but batters at all levels do – even to run bases? 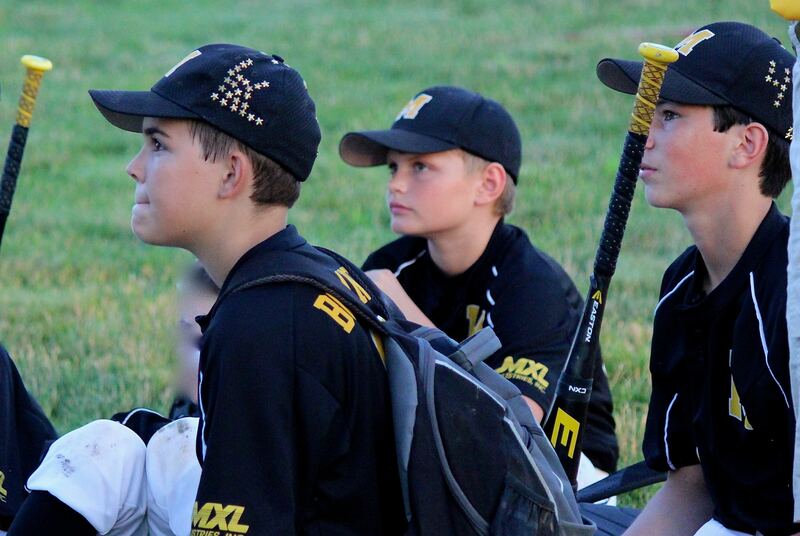 This, at a time when youth bats are bigger, lighter, and more powerful than ever. Not to mention that, due to realignments of age requirements, bigger players often are playing on fields where distances have not been adjusted to compensate for the increased power of these bigger bats and these bigger kids. A recent Facebook post showing a Mountville Indians pitcher wearing protective headgear, prompted one fan to ask, “What kind of helmets do pitchers wear now?” Unfortunately, the answer is – none. The big question is – why not? Rewind to 2011, when an Indians pitcher was hit in the temple by a line drive. (He subsequently was hospitalized, but fully recovered.) Because of this frightening incident, the Indians coaching staff, out of concern for the safety of their players, researched protective headgear options that would help safeguard future Indian pitchers from similar head injuries. There was only one available at that time, but it was not yet in production. However, the Indians players were afforded the unique opportunity to test a prototype of this gear and then provided feedback to the manufacturer, with the hopes that the protective headgear soon would be commercially available. For reasons unknown, the product never went to market, so Indians pitchers have been wearing that same prototype of the headgear ever since. Not surprisingly, it is now showing significant wear. Strange. 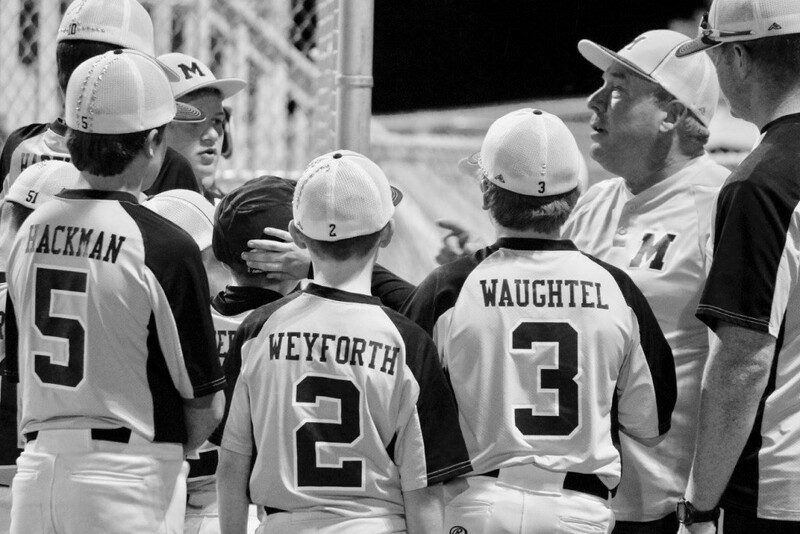 Especially when you consider that in recent years other measures have been implemented by various baseball organizations to make youth baseball safer: requirements that coaches must wear helmets when coaching bases, longer wait times before play can resume after thunder is heard, pitch counts to protect young arms. It’s not that these changes are not good ones, but what about also protecting young pitchers’ heads from the unlikely but potentially catastrophic consequences of being beaned in the noggin by a line drive? Parents of Indians players are cautioned that it’s not known whether or not the prototype protective headgear worn by our pitchers actually would prevent such an injury. Let’s hope we never find out. One thing is certain though – when our coaches’ heads are surrounded by their pillows each night, they rest easier knowing something also surrounds the heads of their young pitchers when they’re on the mound. I’m intrigued by baseball catchers. They are often the unsung heroes of a game,“stolidly going about their duties without attracting much attention.” [*Peter Morris, Catcher: The Evolution of an American Folk Hero] And I’ve noticed that this catching stuff is really one tough job – not a job for just any hero, but a SUPER hero! Crouching in an inherently unnatural and uncomfortable position for long stretches of time, relaying pitches and adjusting to whatever comes across the plate, framing and blocking pitches, popping up quickly, making lightning-speed, on-the-money throws – let’s face it, without these “super” powers behind the plate, even the best pitcher could come-off looking like a bad Robin for Batman. And then, of course, there’s the little detail of equipment, the so-called “tools of ignorance.” A glove, mask, chest protector, and shin guards — arguably a disguise fit for a superhero (sans cape, of course). According to baseball-reference.com, “The term, tools of ignorance, was meant to be ironic, contrasting the intelligence needed by a catcher to handle the duties of the position, with the foolishness needed to play a position hazardous enough to require so much protective equipment.” Yep, sounds like a super hero to me. 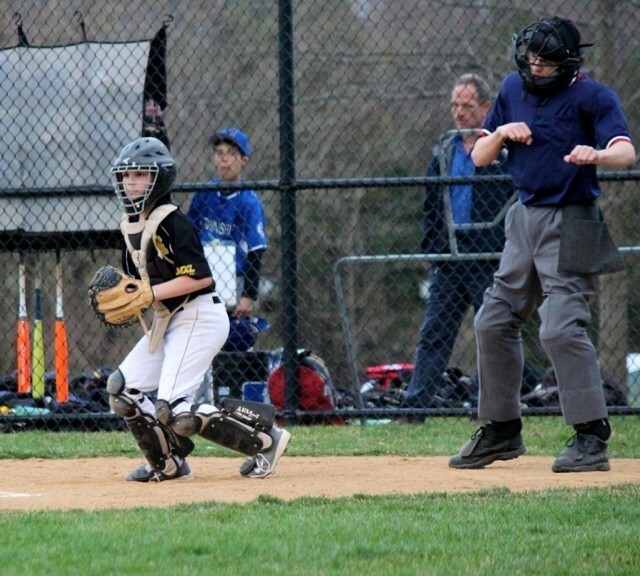 So this is why I am in awe of catchers. I admire the confidence and guts it takes to silence an archenemy’s weapons, coupled with the humility all superheroes possess to quietly change back into being just another ordinary, everyday kind of guy (or gal) at the end of the battle.